Written by Georg Holzmann on May 4, 2017 in News. We released an update of the free Auphonic iOS Recorder with new recording features (samplerate, precision), microphone input gain and monitoring support. The Auphonic Recorder is a high-quality audio recorder with focus on ease of use, audio quality and stability. In combination with the integrated Auphonic Web Service, it’s possible to post process, encode, tag and publish your podcasts, interviews, music recordings on the go with a single click. Monitoring Support: to hear the audio signal during recording with headphones. Microphone Input Gain: if the recorded signal is too loud (peak level display is very high) or produces Clipping, it’s possible to lower the microphone input gain. Note that our default input gain setting is automatically adapted for various microphone types and should work in most situations. Recording Samplerate and Precision: you can choose the recording samplerate (44.1kHz, 48kHz or device default), mono/stereo and set the recording precision/bit depth (16bit or 24bit). 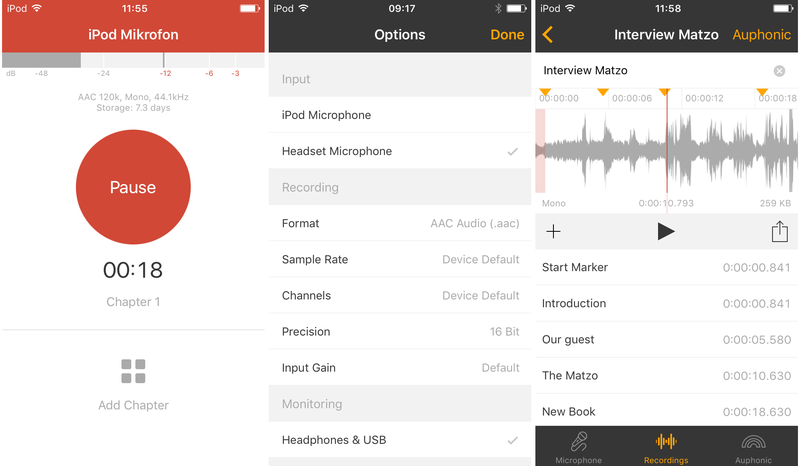 Included new iOS Recorder Help Page in app (in Auphonic tab). Please send us your feedback, bug reports or feature requests to ios@auphonic.com.